Many people dream of being writers. I was not one of them. As a math major in high school, I didn’t focus on creative endeavors and certainly didn’t imagine I would ever publish a book. But here we are: my book is out. Madame Delaborde, my 8th-grade French teacher, gave me a 16/20 on a story I wrote about my grandparents’ farm and I was beaming with pride when she read it out loud to the class. Seconds later, I felt completely embarrassed when she pointed out –in front of the whole class, of course– that she deducted one full point because of a spelling mistake. Such was the French school system or, perhaps, a “tough love” teacher. Over the years French friends urged me to write. In French. A couple of decades later American friends told me they enjoyed my writing. In English. I was a hybrid writer navigating between two different worlds and two different realms of punctuation. I was not convinced I had anything meaningful to share but my outlook changed a few years ago: people not only liked my stories, they also liked my photography. Every book has a genesis. The first one –the first born– is always close to the heart: this book was inspired by my conversations with my ailing father. 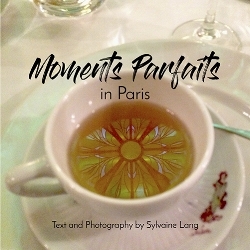 Moments Parfaits in Paris blends some of my favorite photographs with my most beloved stories. It is a series of forty vignettes covering every arrondissement of Paris: a photo, an anecdote, some historical notes and travel tips. Like me, this book is a bit of a hybrid... I hope you’ll enjoy it. Here is a preview of the book with photos, a sample story, and the table of contents. And now, I’m keeping my fingers crossed that spelling mistakes (and Madame Delaborde) will not come back to haunt me!